Holy cats, have we really been blogging for six years?! It feels like Blogiversary 5 just happened, and that it was mere months ago that it was 2007 and we were posting tiny pictures and writing a few sentences each night about whatever was going on under our roof. All of the years of this adventure have been exciting, but the last 12 months in particular have brought things we never could’ve expected when we started this site: a book that somehow landed on the best-seller list, a lighting collection that we designed right here in Richmond with a local company, a short film on Oprah (what?! 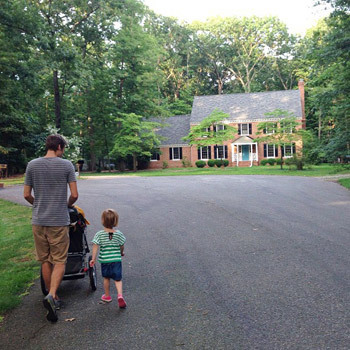 ), and probably the most exciting thing of all to us… a new house in a neighborhood that we’ve dreamed about living in for longer than we’ve even been blogging. So on with the show! 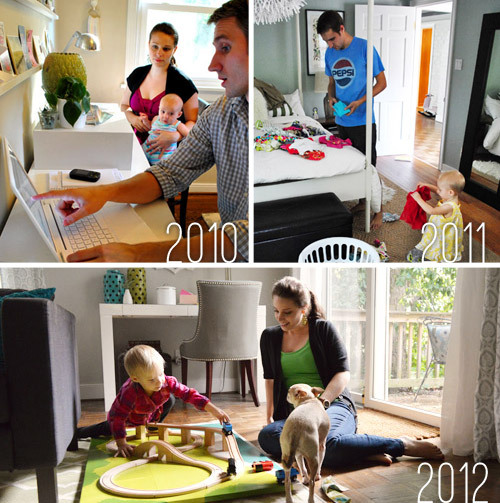 Some of our favorite blogiversary posts to look back on are our “Day In The Life” rundowns, since it’s fun to look back at what times were like in previous years – especially to see how our surroundings and our family has changed (click there to read the ones from 2012, 2011, 2010, & 2009). But documenting yourself all day can make an already long day that much longer (ex: setting up the tripod to capture laundry folding), so this year we instituted an iPhone pic-only policy so that our day would be less filled with camera set-ups and more, well, like a real day in our lives. So forgive the crummy quality of some of the pics. That’s real life, yo. 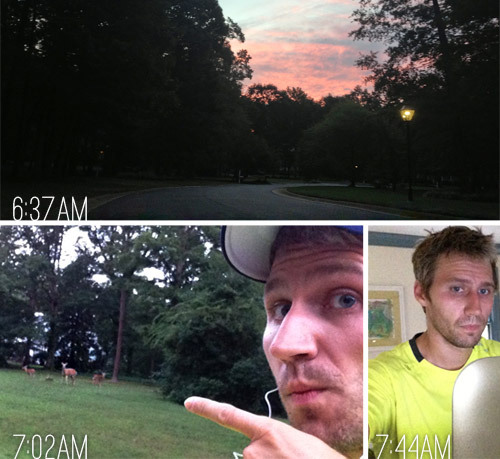 6:15AM: John’s up. Today he goes for a run around the neighborhood, but some days it’s the gym (and some days it’s just staying in bed). Once back, there’s even a little bit of time to respond to a few emails before us girls wake-up. 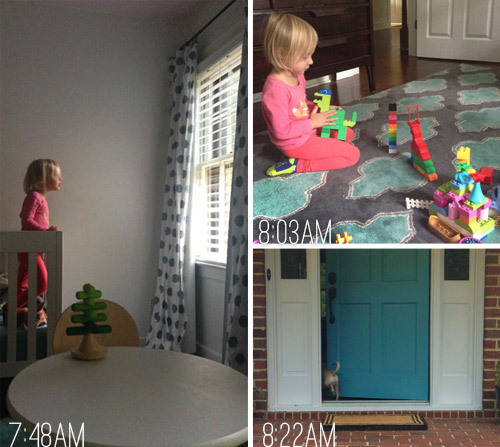 7:45AM: Clara’s awake and she and John start the day slow with some playing in her room (they made a Lego dragon). I’m out of the shower and getting dressed, and Burger gets out of bed, but only for a second for a potty break. Then it’s back up to bed for him. 8:30AM: Everyone’s downstairs. Breakfast is eaten in various places, including Clara’s morning cup of yogurt while she takes in some Jake and the Neverland Pirates after some magnet-doll playing with me. I get a jump on reading, approving, and answering comments that collected overnight while John squeezes in a shower & a shave. 9:00AM: Running a bit behind schedule for school, I get Clara dressed quickly while John tosses her snack into her school bag. John and Clara are off just in time for the 15-20 minute drive to preschool (depending on lights). I hang back to proofread and double-check that morning’s post before it needs to go up at ten – making sure links work, all the images are in, and doing some last minute tweaks. 9:45AM: Clara’s dropped off at preschool so John runs a couple of errands on the way home, namely stopping at the grocery store to replenish the fridge. I steal a few minutes to respond to emails before hitting publish on the post at 10. 10:30AM: John’s home from the grocery store and I’m busy doing comments on the morning post. Once the food is put away, John takes advantage of the quiet house to focus on some computer work: backing up photos, responding to emails, and starting to select and size pictures for a post later in the week. I take some last minute photos for an upcoming post since the sun finally decided to come out and then I do some emailing about the showhouse before starting on a post for the next day. NOON: Time to pick-up Clara at school. Since we’ve got a meeting right afterwards, we both head out. 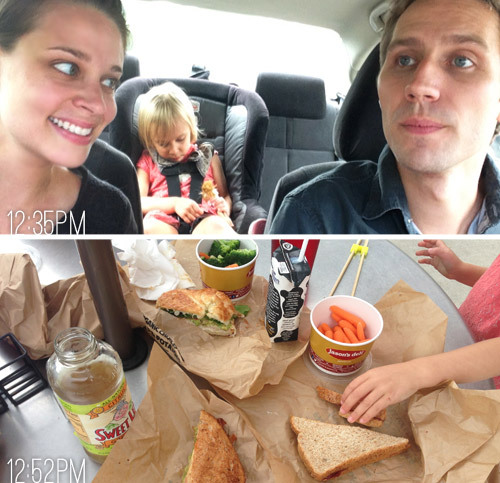 Once Clara’s picked up at 12:30, we swing by Jason’s Deli to grab a quick lunch before of our 1:30 meeting. 1:00PM: Back in the car to make the 30 minute drive to our appointment, which is photographing the Massey Street of Dreams for the quadruple House Crashing post we shared last week. This is already starting to feel like one of those days where we live in the car. 2:15PM: John’s photographing the homes while I gather info from our guide, Justin. I also steal away to publish the afternoon post from my phone at one point. Justin’s 10-year-old daughter was there so Clara spent most of the time playing with her new friend, although they eventually both ended up resting since we were close to Clara’s nap time, and Justin’s daughter was under the weather (hence not being in school and tagging along with us). 3:00PM: We leave the Street of Dreams to make the 40 minute drive home. I use the car ride to catch up on the comments that built up while we were touring. Clara reads a book in the backseat and John checks in with her periodically to make sure she hasn’t fallen asleep. Can’t lose a real nap at home by letting her drift off for ten minutes in the car! 3:45PM: We’re home and Clara is down for a nap. This is usually prime project doing-time, but I have a phone interview in a few minutes related to the Super Soul Sunday clip, and a showhouse call with the builder and his team afterwards. John gets changed into work clothes so he can caulk the sunroom’s trim & nail holes while I juggle two phone calls, a few emails, and attempt to finish the post I started earlier that day. 5:30PM: Clara’s up from her nap, so I go up there to grab her and we play in her room for a little while. 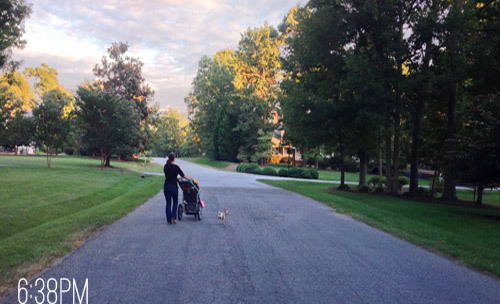 6:00PM: Family walk time! We don’t get one of these every night, but this weather is too gorgeous to skip one today. We talk about Clara’s school day, the upcoming posts we’re both writing, and what projects we each hope to get done the next day. 6:45PM: Home from our walk and time for dinner. 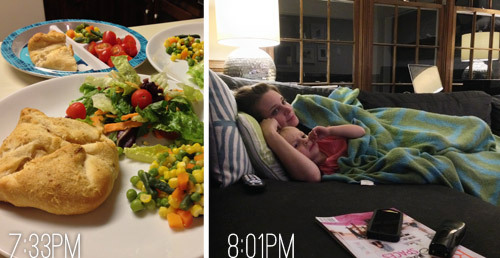 Tonight’s a family favorite – chicken squares (update: here’s the recipe). Clara puts her mixing skills to work with me while I check in on comments again and finally finish the post I’ve been working on sporadically throughout the day. The thing about sharing 7 posts in a 5 day period is that we’re always working on finishing some that are already written, writing new ones, and answering questions for the ones that are already up. 7:30PM: Dinner is ready so we sit down to eat together. Clara gets her tomatoes and veggies down with minimal encouragement and even eats half of a chicken square. I clean up after dinner while John tackles a few emails that have built up throughout the day. 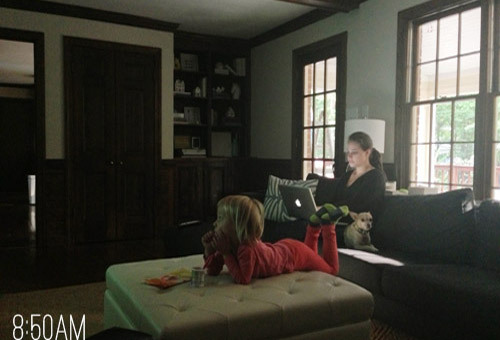 Then Clara and I snuggle on the couch for a few minutes, finishing up the episode of Jake and the Neverland Pirates that she started before school. 8:15PM: Bedtime for Clara. 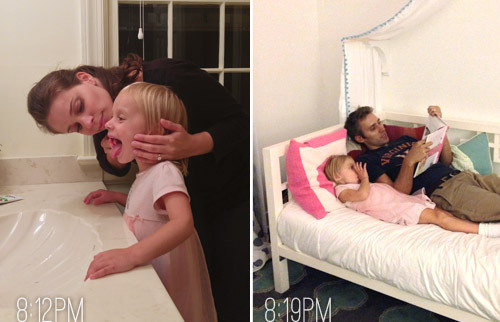 She votes for a different mix of helpers each night, but tonight it’s Mommy on teeth brushing and PJ changing duty while Daddy is in charge of reading the story. 8:30PM: With Clara tucked in bed, it’s time to squeeze in a few more hours of productivity before we stow our laptops for the night. John finishes the post he prepped pictures for earlier in the day while I catch up on any questions that came up on Facebook or Instagram during the day along with sending some book outline stuff to our publisher (yes, we’re officially working on Book Two! Ahh!). Eventually the TV gets turned on and we’re sort of half watching as we finish up some last minute emails, comments, and miscellaneous computer work. We can’t believe other than John’s sunroom caulking, we haven’t done much DIY at all, which means tomorrow will probably be a project-heavy evening (after Clara’s all tucked into bed) to make up for it. 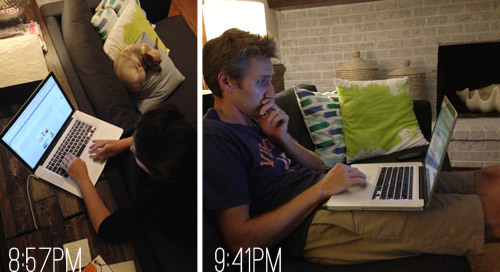 10:00PM: To resist the urge to keep working, we clean up and turn the lights off downstairs, put our computers away, and head up to watch TV in bed. Our current routine is trying to catch up on old Scandal episodes on Netflix (John’s 70% into it and I’m about 120% into it thanks to his sister getting me addicted). 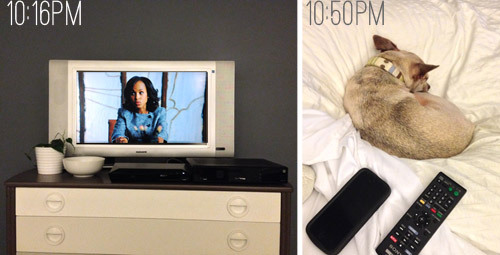 11:30PM: John has already fallen asleep a couple of times mid-Olivia-Pope tirade, so the TV goes off once that episode is over. With teeth brushed and contacts out, John has a second wind and reads a few pages of a book while I decompress with some Pinterest browsing on my cell phone along with some late-night texting with Katie Bower and Roo. Burger finally comes under the covers to snuggle between us, and the lights are out by midnight. I just had to say, I watched your segment on Super Soul Sundays yesterday and it was too sweet! I just about swooned when Oprah (herself!) said your names. Congrats on the show and on 6 years of blogging! Ahhhhh! How crazy was that?! Thanks so much for watching Bridget! I need a nap after reading that! Zzzzz! I don’t know how you guys do it but keep doin’ like you do! Love getting these insights into your day! Do you ever consider letting go of some control over the comments? I know I have my blog set up that only first-time commenters need to be approved. It seems like a lot of your day is taken up with approving comments, especially since your blog is so popular. Thanks Colleen! The reason we like to moderate comments is that a lot of questions roll in each day. So if some comments were auto approved, we’d miss those questions. One of the things we think got us here is engaging with you guys (we love to chat with you guys and help people by answering their q’s) so we’d never want to give that up. Colleen, this is exactly why they are so popular. John and Sherry respond to questions (sometimes repeatedly!) I find it annoying as a reader to not have questions answered by the author. I usually don’t return. Haha! Oh yes, he’s great with an iphone. Just like a regular day! I feel so lucky for Clara, she gets to have both her parents home with her at this age, this has to be a wonderful thing for her. It is so interesting to see how packed your days are. Any more details on book 2 you can share? We’re not quite approved on the concept yet, but hopefully in a few more months we can share some basic info about it. We’re really excited about it! It won’t come out for a few years (books take forever!) so we won’t really get into nitty gritty details for a while! I think it’s awesome you guys are getting another book opportunity :) I have to ask though, do you worry that the concepts or ideas you write about in your book will be dated by the time it is published? I know you could keep it to the timeless stuff, but the trendy stuff is fun, too. Just curious! It’s rough! We killed so many concepts because we didn’t think they were long-lasting enough! We finally came up with something we think is fun and sort of a classic concept – at least we hope it is! Since this year’s Blogiversary posts are already planned, how about a 7 Fact or Fiction one for next year’s? Congrats and wishing you all the best! Ooh what’s that? I’m not cool enough to know what that is. Haha! Items that people might perceive to be fact or fiction about the blog or other self related content. Myth or No Myth would be another way to put it. e.g. Fact- We’ve spent x number of hours remodeling our kitchens. Fiction- The average post gets y number of comments. They don’t all have to be quantifiable, but John might enjoy the potential to do a really cool infographic with it. It all depends on how you want to structure it. You could lead up to it the week before Blogiversary with the statements and then reveal during Blogivesary week whether they are fact or fiction. You could also just share during Blogiversary week in text and graphic format (e.g. “fiction- my middle name is Eminem.”) You could also link them to (or include them in) the Forums. It’s all what’s best for you, your perspective, and the time you have on hand, etc. LOVE THAT IDEA! Thanks Wendy! Is is bad that despite the fact you guys are already swamped and super busy I love the idea of people putting their own Fact or Fiction in the commons and having other people guess on them? The amount of comments that would cause for you guys to moderate would be ridiculous – but I also imagine responses could get totally out of hand in a hilarious way. It would be funny and amazing. I say GO FOR IT! Congrats you guys! 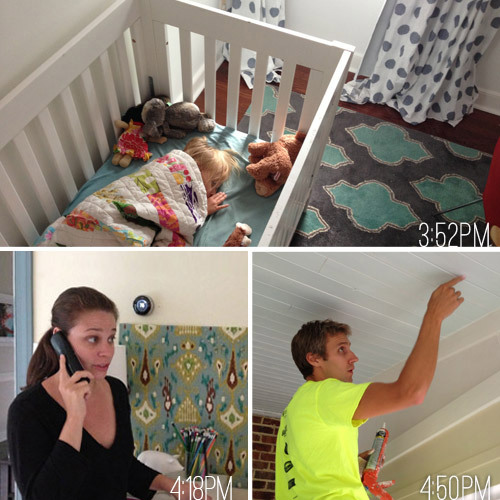 So fun hearing how your day goes down, although if this is a slow DIY day I can’t imagine how you do a busy one! Wow – I’m exhausted just reading how much y’all are able to pack into a day! Happy blogiversary!! Book two!!! Well that just made my day! Scandal is so addicting, I also got my sister addicted to it. Happy Blogiversary! What a day! Wahoo book 2!! This was a great post and congrats on the blogiversary! I’ll have to see if John can find the link. I think he found the recipe online at some point. It’s essentially just putting chicken and onions and a little cream cheese in a crescent roll and baking them. Mmmm. Happy anniversary! I was just thinking about how I meant to do something special for my blog when it turned five in May, yet somehow never did. I miss the days of preschool Pirate rock. Yikes! I mean- I sort of understand the amount of work that is involved in running a website – but I always wondered how you guys got – what seemed to be an infinite- amount of things done! If everybody had your drive and determination- the world would be a better place! Ps your Oprah appearance was adorable! The man is a pro at falling asleep at the best parts! I don’t know how he does it. And yes yes yes, I want to House Crash the heck out of Olivia Pope. Chicken squares = chicken crescents in our house and they are also a favorite here! I will never understand people who say working for yourself/at home isn’t a full time job – its actually much more of a full time job than a 40hr/wk job (trust me, I know first hand). I loved the part about keeping Clara up in the car. I know that routine all too well! Glad to know I don’t have the only kid who only has one “fall asleep” in him per day. I would love the recipe for your Chicken Squares! Love your blog have been following the whole time and I also love your book, it’s on my coffee table, can’t wait for #2 to come out…woo hoo! Thanks Lorie! I’ll have to see if John has a link to the recipe. I think he found it online at some point! 3-4 chicken breasts. Cook the chicken breast – I usually cube it and just cook it w a bit of oil in a pan. My mother-in-law cooks them whole and then shreds the chicken. Once the chicken is hot, mix w/ butter & cream cheese until everything is melted. You need 2 cans of crescent rolls. You’ll end up w/ 8 crescents/squares in the end. So, keep 2 of the triangles together to form a rectangle – I try to smooth out the dotted line so they don’t separate while baking. Scoop some of the chicken mixture on to each rectangle. bring the corners up over the top – opposite corners together. Bake according to directions on crescent can. We serve ours w/ chicken gravy, too! Congrats! Always look forward to the Blogiversary posts! Oh boy! I’m exhausted just reading it! 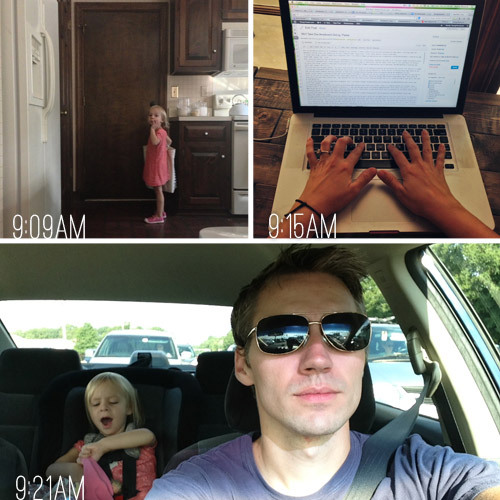 Well done post, loved the iPhone snaps too :) happy 6th blogoversary!! Love you guys! Man, I love blogiversary. It’s just so much fun to see all the fun behind the scenes stuff! It sounds like you are definitely getting your work/life balance better this year – at least I hope so for you. What a fun and busy and work filled day. Happy blogiversary! I have to ask, what did you think of the Dexter finale? Ahhhhhhhhhhhhhhhhhhhhh! I thought it was great. John’s not so sure about it. I’m so torn too! But it was definitely the best episode of the season. And who knew hospitals had such great parking for boats? Haha! That was the one scene I would have done differently. It would have been so much more believable if he snuck her out the side where nobody was or something, but all the people around while he walked by was crazy. So disappointed in Dexter. That could not have been the same series that produced the Trinity season. Congrats on Oprah’s Super Soul Sunday. That’s so cool!! I always look forward to Blogiversary because I LOVE these types of posts! Keep ’em coming! I keep getting a “widgets_tweet_button.html” error message on both my laptop and ipad whenever I open your site. Anyone else having this issue? Happy Blogiversary! Can’t wait to hear about Book 2! Thanks Erin! Sorry about that! It seems to be a twitter glitch that we’ve been hearing about from other people who use that plug-in/button. Trying to get to the bottom of it right now for you guys! This “widgets_tweet_button.html.torrent” popup seems to be all over the place. First noticed it on Yahoo News webpage today, however I am picking it up on other sites as well. It seems to happen when you click anywhere on the webpage. Hope someone can solve the problem real soon!! Is it solved for our page Dave? We removed the “tweet this” button on the bottom of our posts, which is what we heard is causing it. Hope it clears up! Happy Blogiversary!!! I missed the Oprah airing yesterday, is there a link online? or a second airing? We’re going to be sharing the clip on Wednesday afternoon along with some behind the scenes details/pics! So busy! 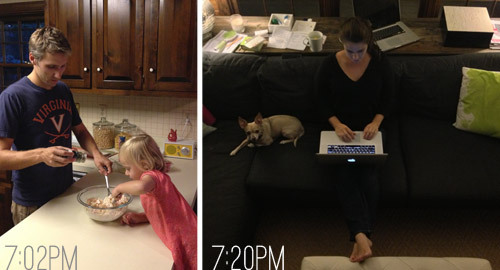 It’s cool to see how you guys spend your days. It’s hard for me to imagine since you don’t work in an office and that’s basically my only job experience so far. I’m only 25, so I guess I have some time yet before it’s too late to experience self-employment :). You stay up a lot later than I would expect! 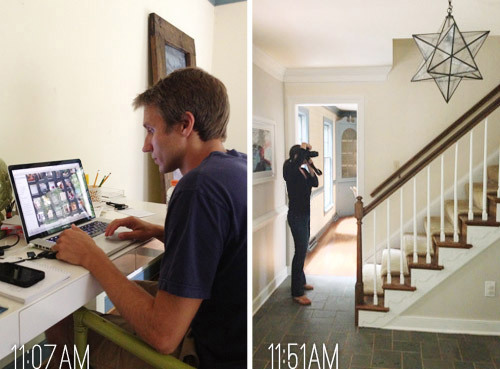 Even though I live in a townhome and can’t really decorate and paint and stuff, I love your blog. I really enjoy the humor with which you approach life. Reading it is so much fun and I look forward to your adventures everyday. Thanks so much for doing what you do! I completely agree Dawn! They truly embody the definition of Light and Fun and the posts are very well written. Intelligence and wit will take you far and that’s just two qualities on a very long list that make the Petersik’s awesome. Happy blogiversary!! Ack, you guys are so sweet. We’re so lucky to have readers like you. then it asks if I would like to open the file or save it. I can choose to cancel out and it does nothing – but I thought I’d let you know. This happens only on your site and it never has before. So sorry about that! It seems to be a twitter glitch that we’ve been hearing about from other people who use that plug-in/button. Trying to get to the bottom of it right now for you guys! Having the same issue and pictures are not loading for me either. We disabled the tweet button that we thought was causing the issue, so Heather, is it happening for you anymore? Tara, Im so sorry about the pics not loading. That sounds crazy and possibly unconnected. Anyone else have that issue? Don’t know what that could be other than a bad connection. Or sometimes virus blocking software blocks our photos due to a glitch and they come back the next day. I just came back to check, including F5’ing to clear my cache, and it didn’t do it. Looks like you nailed where it’s coming from. I’m getting John on the case to post a link for you guys! I think we found the recipe online a few years back! I love chicken squares, too! Fiiiiiirst of all, I think we all need that chicken squares recipe. That looks crazy delicious and hopefully not all that complicated. Second of all: AAAHHHHH A SECOND BOOK!!!! Just added a link to the recipe to the post for you guys! Hope it helps! 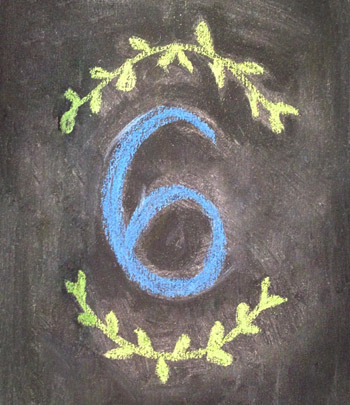 Happy 6th Blogiversary guys! 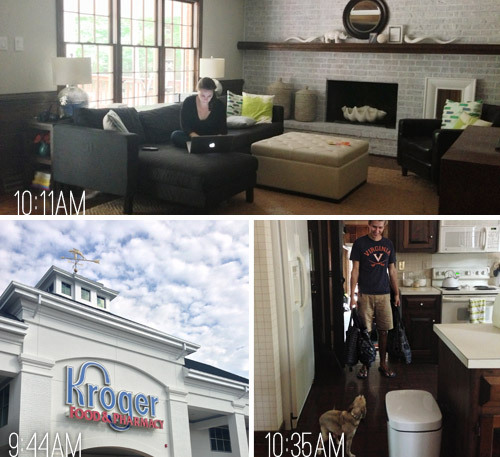 Love reading about an average day in your house. Those chicken squares sounds awesome. And welcome to the Scandal-addict family ;-) We all could use some Olivia Pope in our lives! OK I haven’t even read the entire post yet, but I just HAD to leave a comment. I love love love this week every year, and I got a little overly giddy when I saw it’s blogiversary week! Yippee!! The mom in me says John needs more than six hours of sleep a night. He’ll wreck havoc on his body doing that for the long term. Okay, I’m done mommying now …. Happy Blogiversary! I agree! I love the days he sleeps in. LOVE THEM! I’m always amazed at how much stuff you get done in a single day! I know this particular day you didn’t get much DIY done, but it’s so easy to forget how much work goes into maintaining the blog apart from actual projects (comments, new posts, etc). Do you ever pre-schedule the posts to go out at a certain time or do you always press schedule even if you’re out and about? We only do 2 posts a week on my biz blog and they’re nearly all pre-scheduled which saves my team so much time. I always push publish since questions come in pretty quickly after a post and if we leave the post up without approving/answering comments we tend to get the same one over and over again (so if we squat the post and answer the questions that come in for the first half-hour it tends to cut down on a lot of duplicate questions that might pop up if people don’t see the comments getting approved/answered). Hope that makes sense! Happy Blogiversary! I’m currently up to blogiversary 3 in my YHL-from-the-beginning-catch-up so it’ll be really fun to go through both at the same time. Here’s to 6 more years times five! I love how you guys manage to accomplish so much every day while devoting so much time for Clara. I’m on such a productivity kick right now (just started my own business) and seeing how you organize your day and how you divide and conquer is awesome. Congrats on 6 years!! I have a son two months younger than Clara. All I can say is I am so jealous of how much she will sleep! That is awesome!! Ditto! I have two sons, one is 4 and one is 2 and Clara sleeps probably 3 hrs more per day than my 4 yr old and 2 hrs more than my 2 yr old… crazy jealous here. Oh yes, we’re so grateful about her sleep. It’s one thing we usually can count on (well, a few nights ago she was sick all night, but most times we can!). My only tip (because I’m pretty sure it’s mostly nature and not nurture anyway) is that we swear by blackout shades and a sound machine. Blocks out the light and the sound of us hammering, haha! Love the iPhone snapping this year! Happy Blogoversary! Just updated the post with the recipe link for you guys! Happy Blogiversary! Found your blog a few months ago and is a must read with my morning coffee. Keep up the awesome work. Congrats on your blogiversary! I taped, then watched later in the evening, the Souper Soul Sunday segment and really enjoyed seeing you guys in motion. Also, great news on Book 2! Aw thanks Carmen! You’re so sweet. oops Super. I must be hungry.